Here we are to reveal the results of 11th question of Interview Round: Pageant Series Question. 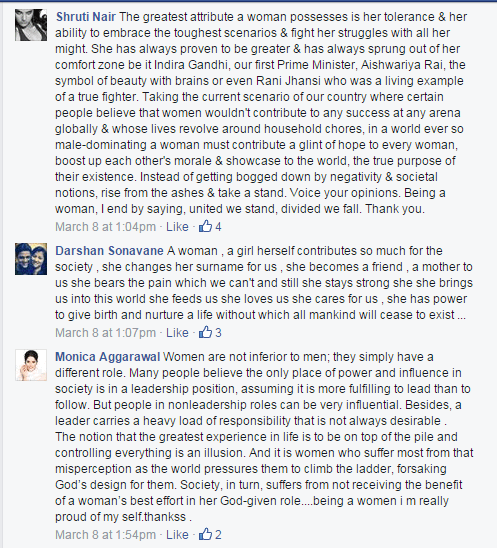 The question this time was given keeping in view the celebration of ‘Women’s Day’. Let’s see who made it to the Top 3 list. Answer: We are in era when women is contributing equally as men in every sphere of life be it science, politics, defense, etc. The gift of life is perhaps the most important contributions of a woman, when she gives birth to a young one. She makes the life of each person she comes across beautiful and worth living. Aman’s short and sweet answer came across as genuine. He talked about celebration of femininity and her biggest contribution of giving birth without dragging it unnecessarily. Hands Down..! Answer: History can not be formed without a Woman! You go through the history of any country in the world, you’ll find there’s always been a Woman behind each and every Victory and Defeat! A Woman dedicates her entire life in the form of a daughter, sister, wife and mother. So, I think, the blessing of a Woman in any form is the biggest contribution!! Thank you. Comments by Admin: Again a meaningful answer without too much of spice. Ratul’s last point ‘Blessing of Woman in any form is the biggest contribution won our hearts and we could not stop keeping him in top 3. Answer: A woman , a girl herself contributes so much for the society , she changes her surname for us , she becomes a friend , a mother to us she bears the pain which we can’t and still she stays strong. She brings us into this world, she feeds us, she loves us, she cares for us , she has power to give birth and nurture a life without which all mankind will cease to exist. Comments by Admin: Darshan conveyed everything in 4 line’s answer. It was a philosophical yet realistic answer. Congratulations to all the winners..!!! PIA WURTZBACH IS THE NEW MISS PHILIPPINES UNIVERSE!